I hope everyone is finding some crafting time today for National Scrapbooking Day! Close To My Heart is celebrating all month long with the Live Beautifully Campaign. We have released gorgeous new papers and stamps for National Scrapbooking Month.....they are only available in the month of May or while supplies last! I decided the perfect pairing for the new products, was to create a card for the Mojo Monday Sketch challenge! 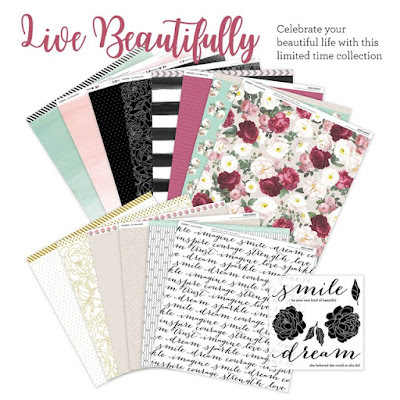 The Live Beautifully Paper packet includes 16 sheets of gorgeous pattern papers. You get two sheets each of six designs and two sheets each of two gold embossed designs. I went with a grey and pink tone for my card, with just a hint of gold. After stamping my flower, I went back over the image with my gold Shimmer Brush to add a little bling. Here is a close up of the papers that are included in the packet. Your card is beautiful. I love the paper choices and the flowers are awesome. So glad you shared your card at Aud Sentiments. What a beautiful card - love the flower!! Thanks for joining us at Make My Monday. Beautiful stamp and paper, and of course the card is wonderful! 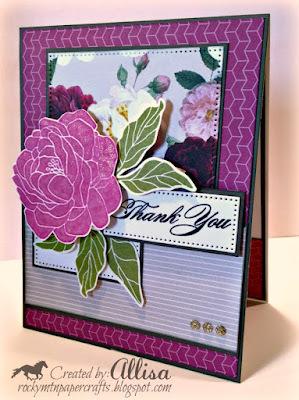 Thanks for joining us at Die Cut Divas. Stunning card, that bright pink is so striking. Great card! Thanks for joining us at HIMCR challenge! Love the pierced dies and the colors of your card! Thanks for joining us Die Cut Diva's!